Find out what I sweat in, what fuelled me and what kept me hydrated during the Big Sur International Marathon! 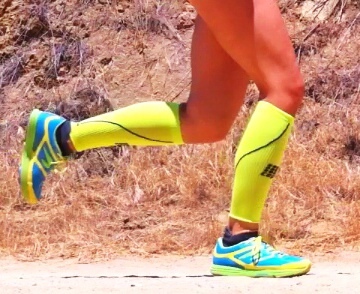 Newton Energy NR’s, Injinji socks, CEP sleeves, winning combo! Socks: Injinji 2.0 Original Weight No-Show in wild lime, because you know, even my socks need to be obnoxiously bright 🙂 I love, love, LOVE Injinji, you guys know by now that they are ALL that I run in for optimal performance, breathable, no-blister, yay-for-toe-splay, all around rad socks. Shoes: Newton Running Energy NR. Marketed as a “gateway trainer”, even though I’m a long-time Newton runner, I just absolutely love this shoe. I reviewed it a few months back and I’ve been putting more and more miles on these bad boys. They are a really nice, light-weight, responsive shoe, with the “Newton feel” plus they are nice and cushy, just like puppies romping around on fluffy clouds. A great go-to shoe for me for my long, slow, slogs! Compression Sleeves: CEP Compression sleeves. Some people like compression sleeves for recovery, I like them for recovery and for racing in, they are both functional (increasing blood circulation) and dare I say…cute. For this race I chose my neon yellow CEP compression sleeves, I have tried a few different brands of sleeves, but I just love the super tight hug that these bad boys give my calves! 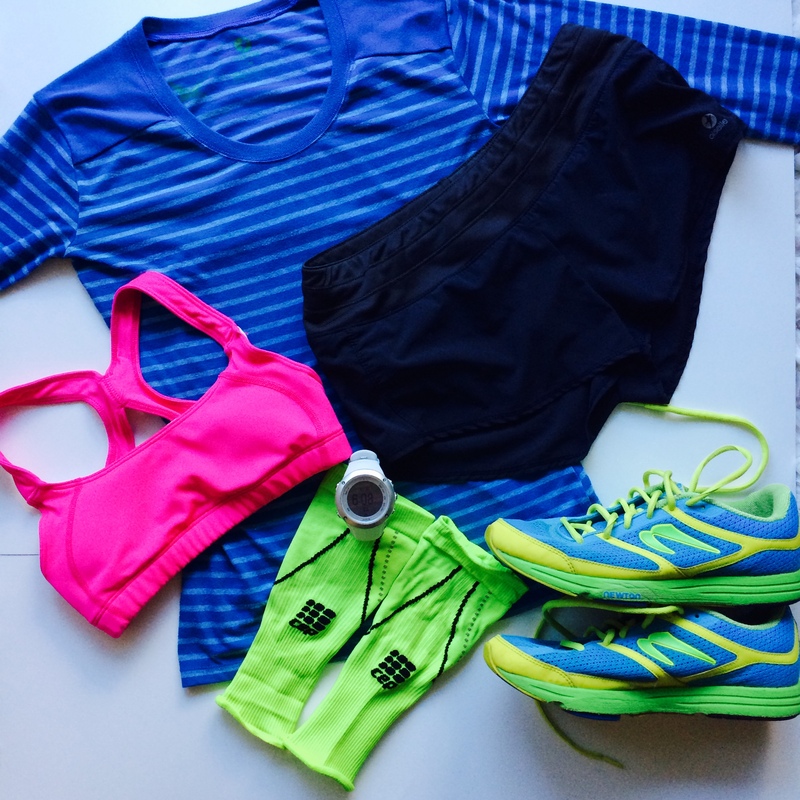 Oiselle, head to toe! Earn Your Stripes top, Lesko bra, Mac Rogas. Top: Oiselle Earn Your Stripes Long Sleeve in brill blue. I made the last-minute decision, literally before I went out the hotel door to the race to switch to this top. I’m still not sure that was the right move, not because I don’t love this hot top, but because I made a poor decision on the weather that day, I definitely was a little toastier on my upper half than I wanted to be. Regardless of my hasty, last-minute choice, this fabric is amazing, sweat-wicking and so, so, SO soft! I live in this shirt, no really, I’m wearing it right now! 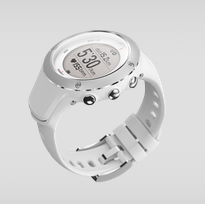 Watch: Suunto Ambit 2S. This watch is a really beauty, not only that, but it has brains too, it kept me on pace during the 26.2, made me cry when I looked at it and realized I was going to PR and kept me in check the entire day! My fiancé gave me this awesome watch for my birthday in December and ever since then I’ve been loving the new watch in my life! 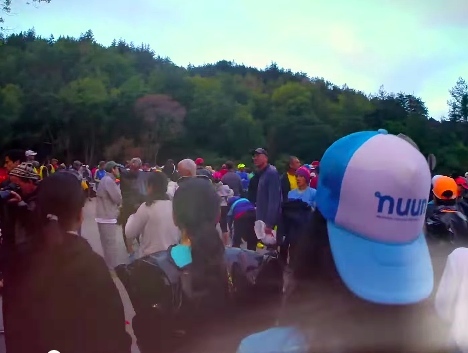 Backwards Nuun hat, ready at the start line! or fired up, is just a click away if I need it. Love my little shuffle, I’ve had it for years, it’s light, small and never fails! Headgear: Nuun Trucker hat. My signature backwards hat is my number one comfort item! It works great for keeping my lion’s mane out of my face and works well when doused with water to keep my head cool. Pack: Ultimate Direction Meow waist pack. I opted to use this to store my extra nutrition for this race. I usually can go without a pack, but because I was packing extra Roctane powder (larger packaging) I needed some extra storage. This pack works great for stashing your phone, ID, keys and nutrition. It’s big enough to store enough to get you through a big race, but small enough that it’s not cumbersome to wear. Water Bottle: Ultimate Direction Handy 20. I LOVE this handheld! 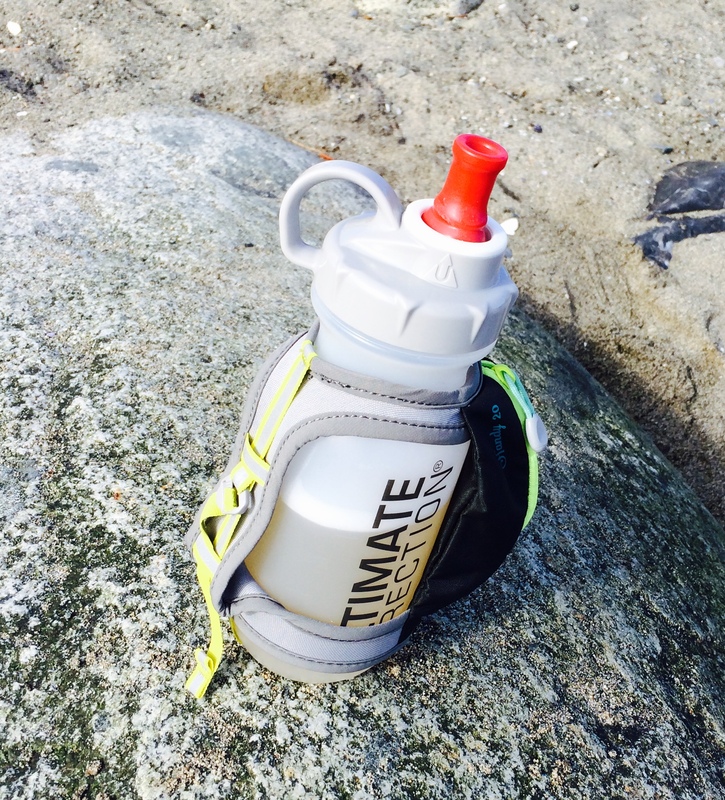 As the name indicates, it has a 20 ounce capacity, I was able to be environmentally friendly at the aid stations and refill my bottle instead of using the cups up! The hand strap is super soft, making it a comfortable fit to my hand, even through 5+ hours. 🙂 The handheld also had a large zip pocket that I was able to stash most of my gels in for the run, making them easily accessible and at the ready! NUTRITION/HYDRATION: GU Grape Roctane Energy Drink. I started the race off with a Roctane drink mix mixed into my water bottle to get me going and sustain me for the first portion of the race, I also had a 2nd pouch at around mile 18 when I was having a little trouble getting gels into my belly. I love the light grape flavor, it’s easily one of the tastiest carb/electrolyte drink mixes out there and it always goes down smooth for me and it has 240 calories per serving! And for gels, I used GU Roctane Gels in a variety of flavors, each gel has 100 calories so I tried to consume one per 45 mins, along with water. I’d like to give a thumbs up to the salted caramel GU energy gel. It was a special holiday flavor this year, and it’s tasty. As for other stuff, I usually wear black, because I sweat like crazy when running and black doesn’t show the sweat stains. I also love my compression shorts. Didn’t think I would at first, but no chafing–haven’t found shorts that do that. Please update your blog again. I really enjoyed reading your posts.